Home » Reading Experience » Reading Experience: Do you Trust this Alien? 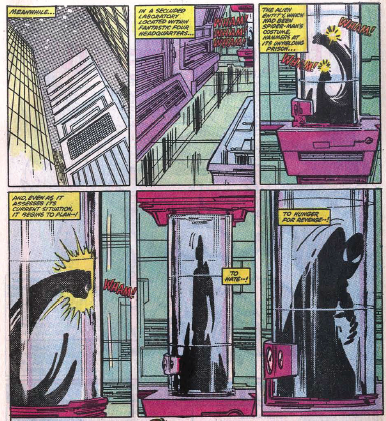 Just as an addendum to my post earlier this week about the Venom symbiote not belonging anywhere near a supergroup of superheroes like the Avengers, I thought I’d look back at the issue of Amazing Spider-Man where we discovered that there was, indeed, something a bit suspicious about that black goo Peter Parker picked up during Marvel’s Secret Wars miniseries. And from there we learn that Peter’s new suit is actually a living entity using Spidey as a “host” to live. Additionally, we learn that the symbiote prioritizes its own preservation above everything else. When Spider-Man tries to get the suit off of him, the symbiote sinks its claws in deeper, nearly suffocating its host. And once the suit is finally removed with an assist from a sonic blaster and the Human Torch’s fire, we have an ominous panel at the end of the issue with the symbiote plotting its revenge on those who have scorned it – notably, Spider-Man. The rest, of course, is history that seemingly refuses to go away with every new iteration of Venom and all of the symbiote’s spawn over the years (I’ve lost count). So with all that said, I had one commenter tell me earlier this week that while inviting Venom to be an Avenger may seem outlandish, we have to consider the person donning the symbiote and the context of how being on the Avengers may help that character grow. I can’t really argue that point, but given the history of this strange little alien creature, dating back to the first instance where we all discovered it was a strange little alien creature, I find it hard to believe that anyone charged with protecting the Earth would put any faith and trust into this thing. While the Avengers certainly have the power and resources to squash the symbiote if it goes rogue, and watching Flash battle his newest addiction as he realizes he can’t just access his Venom persona whenever he feels like it is interesting, the whole concept is built upon a premise that tapdances all over my suspension of disbelief. And going back and re-reading this old issues from the 1980s, gives me no reason to reconsider.